The 5,600 metre summit of Chile’s Cerro Toco. "Thank you, Pachamama, for allowing us to reach this sacred place," I say through chattering teeth while offering coca leaves to the matriarchal deity revered by many Andean Indigenous peoples. Benevolent Mother Earth and goddess of fertility, Pachamama's spirit is still believed by some to preside over the natural world – including here on the freezing summit of Cerro Toco, a 5,600-metre-high volcano in northern Chile's Atacama Desert. After paying my respects to the Incan goddess, I stuff a wad of the leaves into my mouth, tucking it into my cheek like chewing tobacco. The Andean plant from which cocaine is extracted, coca has been consumed for centuries to combat the effects of altitude. And it's working – I haven't had a headache since departing northwestern Argentina's Salta province for the Chilean town of San Pedro de Atacama a week ago on a travesia, Spanish for journey or crossing. And good thing, since I didn't have time to be slowed down. Before reaching the Atacama's dunes, snow-capped volcanoes and shimmering salt flats called salars, I crossed fertile subtropical valleys and jagged, mineral-streaked red-rock canyons, then ascended toward the puna, a Quechua name for the arid, treeless plateau that rises up to meet the central Andes. There, violent windstorms, known as pamperos, scour the land, condors cruise cloudless indigo skies and wild guanacos and red foxes roam across the bofedales – the puna's scruffy, slow-growing grasslands studded with giant candelabra cactuses, known locally as cardon. In just a few days, I've covered some of the wildest terrain in southern South America. My trip is actually a Travesia with a capital T, a fully guided, small-group overland expedition offered by Explora, a Chilean company that owns several all-inclusive "luxury adventure" hotels in South America. T.S. Eliot famously wrote that "the journey, not the arrival, matters." Alejandro Tardel, Explora's chief planner, couldn't agree more. He calls travesias "a form of freedom, where you don't know what course you will take tomorrow." Over plates piled high with barbecued beef at Finca Rancagua, a ranch near the beautifully preserved colonial town of Cachi, he adds that trying to combine enough information for guests in advance with an element of surprise is key to the Travesia philosophy. Explora purchased Finca Rancagua a decade ago, transforming it from a derelict ranch into a 5,000-hectare luxury base camp. We spend our three days here climbing rock formations, hiking through slot canyons and, most importantly, acclimatizing before ascending higher into the almost mythical puna, a place that Tardel says will "purify your soul as the wind blows through you." Classic road trips require classic roads, preferably less travelled. Argentina's Ruta Nacional 40 (RN40) is one of the world's longest and most spectacular highways, stretching from the southernmost tip of Patagonia to the northern highlands bordering Bolivia. We set off on it through the Calchaquies Valleys, a stunning series of canyons and rock formations named for the Indigenous Calchaqui people who fiercely resisted the invading Spanish conquistadors. Subtropical rain forests become scrublands as we climb Cuesta del Obispo (Bishop's Slope), a twisty, unpaved mountain road named for a Catholic missionary who passed through here in the early 17th century. At the top is otherworldly Los Cardones National Park, 65,000 square hectares of protected, desolate beauty where giant two-storey-high cactuses, some hundreds of years old, stand as a prickly army of sentinels guarding the approaches to the windswept puna. The snow-capped summit of 6,380-metre Nevado de Cachi, the highest mountain in the region, dominates the horizon. Also visible is the cone of Llullaillaco, a 6,739-metre-high volcano where the mummified remains of three Incan children were discovered by archeologists in 1999. Sacrificed to the gods circa 1500 by being drugged and left to freeze on top of the mountain, their remarkably well-preserved bodies now rest in Salta's Museum of High Altitude Archaeology. Each stage of our journey offers multihour treks through increasingly wild terrain. We cross thistle-covered natural pasturelands dotted with saguaro cactuses. We scramble up steep hillsides and over fantastic rock formations, their mineral layers the colours of Neapolitan ice cream. And we descend into pink gorges to soak our feet in icy streams. Incredibly, we don't encounter anyone on these ancient pathways long frequented by traders and soldiers, save for an old woman hawking fresh goat cheese. "Few outsiders know about these trails," explains our guide, Esteban Cabanillas, as we lunch on roast beef sandwiches on a saddle between the wind-whipped Los Gemelos, a pair of dormant volcanoes. It feels as if we have all of northwestern Argentina to ourselves. Thankfully, venturing so far off the grid doesn't mean roughing it. Hot showers and hearty food await us at our second camp, La Quesera, a quadrangle of stone cabins tucked into an alpine ravine. An adjacent corral holds sheep guarded by three dogs trained to fend off hungry pumas. After dining on grilled pork strips, minestrone soup, gnocchi and fresh oranges smothered in mascarpone cheese and rosemary, I step out into the courtyard. On this cold, clear, subzero evening, the southern celestial canopy is streaked with countless stars and galaxies. Chile’s Atacama Desert contains many expansive salt flats called salars that attract migratory birds such as pink flamingos. The next day we hit an unpaved stretch of RN 40 that reaches nearly 5,000 metres at a pass called Abra del Acay. It then descends into the Atacama, the driest non-polar desert on Earth, where in some parts not a single drop of precipitation has been recorded in more than four centuries. At the Chilean frontier, we switch vehicles and guides to drive about 20 kilometres to our final camp. 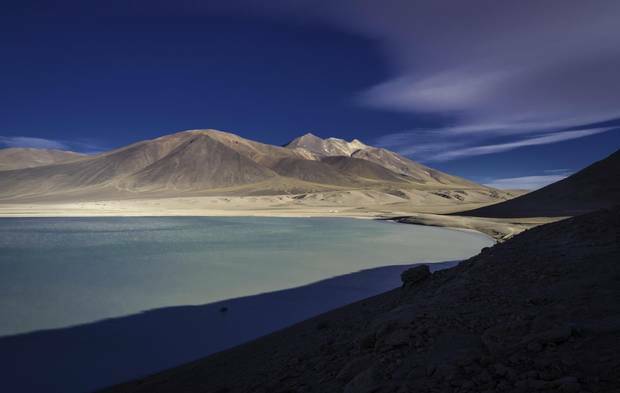 At 4,200 metres, El Laco comprises a row of six-metre-long steel shipping containers, mere specks occupying a vast lunar-like expanse at the foot of an extinct volcano. Fitted with thermal insulation, which is critical here where winter temperatures can drop to minus 30 degrees, each "cabin" has two camp beds, thick down Marmot sleeping bags and kerosene lamps. It feels like glamping on the moon. In the morning, we depart to explore a nearby salt flat called Salar de Aguas Calientes. Part of Los Flamencos National Reserve, a high-altitude, volcano-ringed wetland and protected habitat for rare and endangered wildlife such as vicuna and Darwin's rhea, Aguas Calientes also draws thousands of pink flamingos who feed on microscopic algae in Tuyajito Lagoon. As we approach, hundreds of them stand on single stick legs, their bodies reflected in its shallow, shimmering waters. The journey's end comes in the form of a tranquil 17-hectare compound on the outskirts of San Pedro de Atacama, the oasis that has become one of Chile's prime tourist destinations. And here, Explora's all-inclusive luxury lodge caters to an upscale clientele expecting to return from daily excursions to a three-course meal, a bottle of malbec and a king-size bed. As transformative journeys go, this one has checked all the boxes – adventures, physical challenges, camaraderie and a lingering sense of wonder. Air Canada offers direct daily service from Toronto to Buenos Aires via Santiago. The return flight can be joined in Santiago. Flights are considerably cheaper between the Atacama capital of Calama and Santiago than Calama and Salta. Several Aerolineas Argentinas flights a day connect Buenos Aires with Salta, from where Explora's Travesia begins. This writer flew business class aboard Air Canada's new 787-8 Dreamliner, which made the nearly 14-hour overnight journey infinitely more bearable. Explora's nine-day, eight-night Travesia between Salta and San Pedro de Atacama can be taken either from Argentina or Chile, following the same itinerary. It includes three nights in Explora's all-inclusive Atacama hotel and five nights in its remote Andean camps. Vans carry up to six guests a group between countries and routes that access hiking trails in some of South America's most isolated and beautiful landscapes. 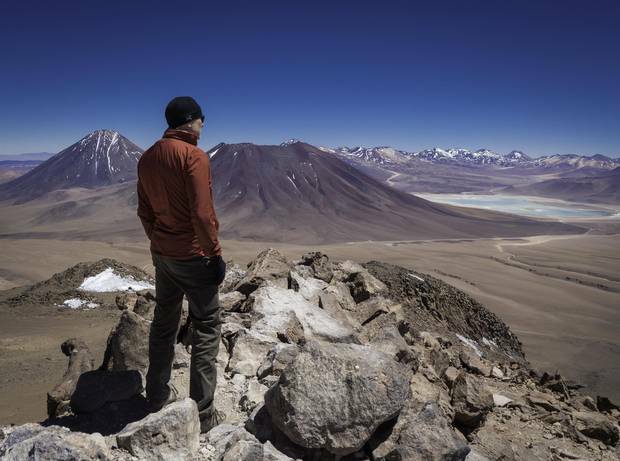 Salta-Atacama Travesias run from March through December, with double-occupancy rates starting from $6,500 (U.S.) a person. The price includes all exploration, accommodation, meals and bar, transportation and National Parks entrance fees. For more information, see explora.com. The writer travelled as a guest of Explora. It did not review or approve this article.